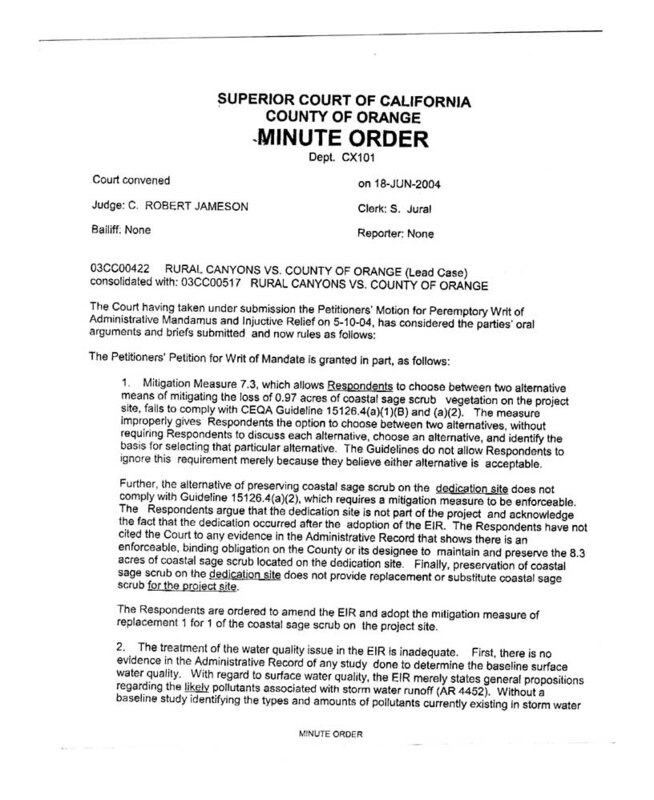 Saturday, June 26, 2004--Orange County Superior Court Judge C. Robert Jameson has blocked a controversial housing tract on the banks of Silverado Creek and ordered the county to study the impact of the 12 proposed mansions on water quality. RCCF sued the county and developer in September of 2003 after county supervisors ignored the pleas of canyon residents and approved the plans of Las Vegas based CCRC Farms to carve 75-foot high manufactured slopes out of the rolling hillsides of the historic Holtz Ranch, displacing over 900,000 cubic yards of earth, and exceeding the grading limits of the governing Silverado-Modjeska (Sil-Mod) Specific Plan. 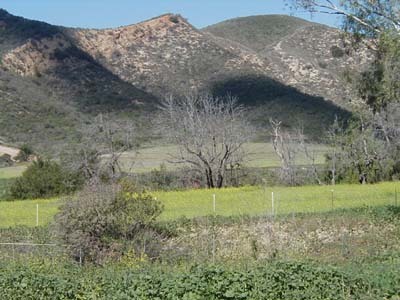 Although the 12 equestrian-oriented mansions, with graded building pads the size of football fields, would drain urban pollutants and animal waste directly into nearby Silverado Creek, the county did not adequately assess the creek's water quality or the project's impact on it, the court ruled. 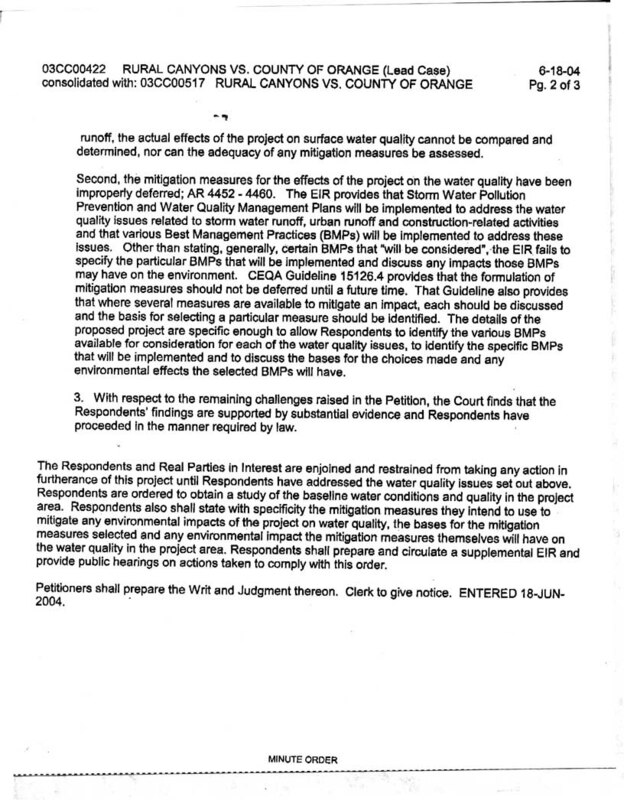 The developer-prepared environmental impact report (EIR) did not include any measurements of the water quality in Silverado Creek, which flows into Santiago Creek and then into the Santa Ana River, nor any specific data about the types and amounts of pollutants in stormwater runoff from the project. "Without a baseline study identifying the types and amounts of pollutants currently existing in storm water runoff," wrote Jameson, "the actual effects of the project on surface water quality cannot be compared and determined, nor can the adequacy of any mitigation measures be assessed." The EIR also failed to specify how the project's impact on water quality would be mitigated beyond promising future studies and Best Managment Practices (BMPs). Jameson rejected this approach, noting that "CEQA [California Environmental Quality Act] Guideline 15126.4 provides that formulation of mitigation measures should not be deferred until a future time." Judge Jameson's ruling has been hailed for repudiating the County's longstanding practice of postponing water quality studies and mitigation plans until after project approval, when they can be carried out administratively, shielded from public scrutiny. "This practice has led us over the years to where we are today in this county, with the dirtiest beaches in the state," said Silverado resident and water quality activist Sherry Meddick. The court also found that the loss of coastal sage scrub habitat destroyed by project grading had not been properly mitigated. Environmental attorneys Frank P. Angel and Edward Grutzmacher argued the successful case for RCCF.